The Boys Clubs opened in San Antonio in 1939, in a small facility on Dolorosa Street. Over the years the clubs grew in stature, membership and facilities, so much that in 1963, Congressman Henry B. Gonzalez presented then President John F. Kennedy with a gavel and handmade box created by the members in their woodworking shop. In 1976, girls were invited to become members and the name of the clubs was officially changed in 1991 to the Boys & Girls Clubs of San Antonio. Through the decades the programming and facilities have improved but the mission has remained the same. Boys & Girls Clubs of San Antonio’s mission is to enhance the educational, social, and moral development of San Antonio’s youth ages 6-18, especially those most disadvantaged by providing a fun, safe place full of age appropriate activities and opportunities. Through the professional staff, thriving facilities, dynamic volunteers, and strong links to the community, the clubs provide professionally designed youth development programs. Today, BGCSA serves more than 9,200 Club members annually, ages 6 – 18, and operates seven branch locations in the city of San Antonio. Membership is open to all children in San Antonio for nominal annual membership dues ($50). No child is turned away due to an inability to pay. The majority of the club’s membership is comprised of minority children (95%), from single parent / grandparent families (62%) and receives some form of federal assistance (75%). The clubs’ impact is undeniable: 99% of members stayed in school and successfully progress to the next grade level, 100% of graduating teen members pursued higher education 71% made notable progress in character development and 99% improved their grades in basic skills courses (math, science, reading). At the venerable age of 75, the Boys & Girls Clubs of San Antonio reached a crossroads: aging facilities had becoming inadequate for the needs of the organization, and an expansion was necessary to maximize the Club’s impact on San Antonio’s at-risk youth population. 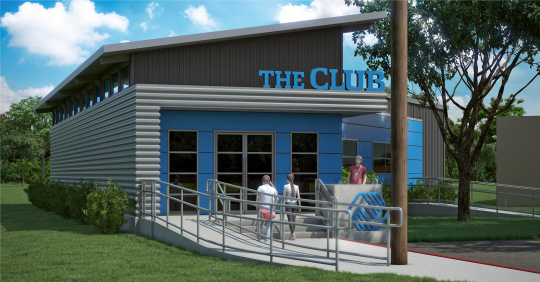 In early 2015, the Boys & Girls Clubs of San Antonio decided to launch an $8.8 million capital campaign to build the May’s Family Clubhouse in the Lone Star neighborhood. On January 5, 2017, Crescent Growth Capital worked with the Boys & Girls Clubs of San Antonio to close a $7,267,118 NMTC financing for the new May’s Family Clubhouse, utilizing NMTC allocation provided by the Local Initiatives Support Corporation, NMTC equity investment provided by Capital One, and a capital campaign bridge loan provided by Frost Bank. The May’s Family Clubhouse is located in a neighborhood that offers youths few opportunities for success, and as a result, the neighborhood has suffered: the Lone Star neighborhood has the highest juvenile crime rate in San Antonio, and nearly double the City’s average child abuse and teen pregnancy rates. The proposed branch at 829 Nogalitos is anticipated to have 650 members and daily attendance of about 225 youths, utilizing a state-of-the-art facility that features a learning center, multi-media centers, an art studio, a teen center, a teaching kitchen and a game room. The May’s Family Clubhouse will also be situated at the trail head for the San Pedro Creek development.